It has been more than a year since Season 4 of what I consider the greatest show to ever air on American television premiered on Netflix. I had planned to write a review of it after I gorged on the fifteen plus-sized episodes, but after a couple abortive attempts I gave up on it. A few weeks ago I found myself watching through the show again and when I got to the new stuff, I was surprised at how much I enjoyed it. I liked it the first time, but this time through it really clicked for me. While this new season is a different beast than the original run it is almost as good. I think it is a shame that many people seem to have written it off as a poor addition. It does have its faults. The first and biggest one is that they couldn’t get the entire cast there at the same time for the bulk of the episodes. The busy schedules of the stars more than half a decade after the show ended is the unfortunate reality we live in. 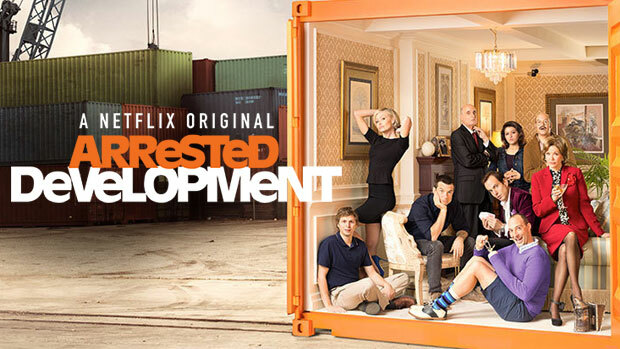 In order to get any new Arrested Development at all we had to accept that the cast was going to be scattered. This does kill one of the best parts of the show, the crack timing of all the characters in every scene. Season 4 is at its best when it has most of its characters together; scenes which are all the more notable for how infrequent they are. By giving each of the characters room to breathe on their own it becomes apparent that most of them are wholly unlikable. Early on even the usually relatable, though never as good a person as he thinks he is, Michael looks incredibly bad. The second big problem is the ending. Spoiling as little as possible, I have to say that it is unconscionable that they ended it with a cliffhanger. The show has already gotten one miracle revival. No matter what hopes the creators and cast have for a movie or another Netflix season, they needed to end this with some closure. Instead, many of the plot threads only sort of tie together into an opening for the next story. Much like how the bulk of the episodes end. If there was a solid guarantee of more Arrested Development, then maybe the ending would be acceptable. Since there isn’t it makes the ending we received somewhat tragic. Especially in light of the nearly perfect conclusion Season 3 had. Still, Season 4 works. Individually, each episode may not be perfect, but the season as a whole tells a great story. It is still subtle, clever and layered, but the usual 3 episode story is blown up into a 15 episode season. It works even better on second viewing; once the viewer knows what’s coming many of the jokes hit all the harder. It is like getting tiny glimpses of the gears in a watch. At first you can only see a few of the moving parts and have no idea how it all fits together. Each episode shows another small part, but each glimpse tells more the bigger picture. Once it all is revealed, the intricate nature of how it all works together is apparent. What is most amazing about this is that they manage to do without the character actually interacting, other than in pairs and with Michael. They actually make the separated cast work with the story. Without Michael there to keep everyone together, the family has dispersed over the six or so years since the show ended. Lucille has gone to prison, George Sr is near the Mexican border scamming CEO’s, George Michael has gone to college, etc. While most of their circumstances are roughly the same, though their precise situation is different, when the show starts Michael has hit rock bottom. It is hard to see him like that. The others are awful enough that the viewer can enjoy their failures. While Michael tends to be self-righteous and smug, but he is usually a smidge or so better the rest of his family. It’s not a lot, but he at least seems redeemable. At the start here he is pushed to the worst possible level of his indulging his faults. The whole season seems to be Michael’s refusal to actually climb back out of that hole. Every time he gets close, he jumps right back in. In the last episode, when George Michael finally punches him in the face it feels well-deserved. Once I accepted that the show can’t be exactly like it was before, I gained a greater appreciation for what Season 4 is and what it does. Instead of futilely trying to recreate the magic of the original run, it keeps many of the same traits and does something slightly different. Season 4 is not the continuing misadventures of this horrible family; it is one big overarching episode in their story. And it is a pretty damn good episode. I only hope they get the chance to finish the story.